The Breeze At Spithead. Part 9. The Grand Finale. Now the dalliance of Parliament and the blinding stupidity of the Admiralty combined into what was a potentially deadly set of circumstances. Bridport had heard French fleet was out on May 3, but the winds were not favorable for the Channel Fleet to sail until May 7. Because the Seamen’s Bill had not passed Commons and the Fleet now knew of the Admiralty order to suppress all dissent, he knew fleet would not move. So he did the prudent thing and he didn’t order it to sortie. The Fleet delegates now moved to force action. Sometime during the night of May 6-7 the delegates decided to remove all unpopular officers as a way of demonstrating their resolve and to remove potential flashpoints of violence. They also suspected that the Admiralty would attempt to deal with the mutiny ship by ship. To prevent this from happening all the ships in the mutiny were ordered to move to St. Helens where they could be sequestered from Admiralty agents and kept out of range of the militia congregating in Portsmouth. Around 9 am the delegates began moving from ship to ship passing the word. Some officers were removed with every courtesy. Others were unceremoniously bundled ashore. The Breeze At Spithead, Part 4. The men of the Channel Fleet waited patiently throughout the month of March and into April for a response to the appeals for higher wages they had addressed to Lord Howe. By early April, though, it became apparent that no redress was planned and their man-to-man request of a flag officer they held in high esteem had been dismissed without an answer. 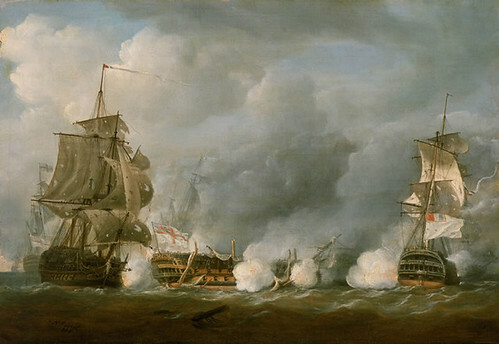 The Spithead Mutiny, as we discuss here, did not erupt from a single deed, rather it was the culmination of a long pattern of the Admiralty ignoring some very basic demands for more equitable terms of service on the part of British sailors and equally ignoring and thereby tolerating the existence of petty tyrants within the ranks of officers and warrant officers. In the past, when wars were shorter and fleets routinely stood down over the winter, these issues did not reach critical mass. During the era which began with the French Revolutionary Wars changed all that. The British navy was kept constantly at sea, except for the brief period of the Peace of Amiens, for 22 years. Most of the British fleet was involved in endlessly churning wakes in the sea outside the great Continental ports of Brest, Toulon, Marseilles, Rochefort, and Texel. A life of hardship, danger, and deprivation without the respite of shore leave, prize money, or even combat. The impact this had on pressed men and volunteers alike is hard for us to comprehend in an age where there we argue over whether or not a combat tour of 15 months is a breach of faith. The Breeze at Spithead, Part 1. We posted yesterday that we would start a series of posts on the mutinies of the Royal Navy at Spithead and The Nore. We will be using G. E. Mainwaring’s The Floating Republic: an account of the mutinies at Spithead and The Nore in 1797 as our primary source with some commentary when Mainwaring seems to run far afield. By the time of the Spithead and Nore mutines, the war against Revolutionary France was not going well. Britain’s Continental allies had been driven from the field and though the British navy had been victorious, it was now on the defensive. It could not operate in the Mediterranean and was pinned down blockading French and Dutch ports to prevent an invasion of Great Britain. Often the truth of combat during the Age of Sail is at least as strange as the fiction set during that era. Sometimes the participants went on to fame. More often their fate is cloaked in obscurity. I plan on writing on more of these happenings in the future but for the first installment I’ll take the case of Midshipman Matthew Flinders of HMS Bellerophon during the Battle of Ushant, also known as The Glorious First of June fought on 1 June 1784.